How to become a managing trader? Any InstaForex Company´s customer having a trading account can become a managing trader within the framework of the PAMM system. If you do already have a trading account with InstaForex Company and would like to register it with the PAMM system, please log in to Client Cabinet and choose the "PAMM system" menu option, specify a name of your investment project, contact information which shall be available to investors and your PAMM account monitoring settings. Immediately after the registration procedure, your account becomes part of the PAMM system and appears on the monitoring list which is shown in Client Cabinets of investors, in the Monitoring section of the official company´s website and on the websites of InstaForex partners. You may be offered various investments as soon as during first hours after the registration has been passed; you can either accept or decline them. To see the list of investment acceptance requests, visit the PAMM section of Client Cabinet and click on the "My investments" option. To get additional information on how to become a managing trader within the PAMM system of InstaForex Company, please visit the PAMM Registration page of the company´s website. Gaining part of investment return. The key principle of the PAMM system is that a PAMM trader gets part of the profit he/she made with investments as fee for investment management. The profit share is calculated on the basis of a profit percentage set by a PAMM trader when registering. Thus, if a PAMM trader has made profit working with the funds entrusted him/her by an investor, the trader gains not only part of his/her own profit according to the percentage set in his/her PAMM account, but also part of the investor´s profit. The latter is returned to the PAMM account of the managing trader right after the refund to the investor. Having registered with the PAMM system and replenished your PAMM account, you set to work: you start trading and demonstrate positive results of trading. Your account attracts attention of an investor who eventually decides to invest funds in it and sends you an investment acceptance request. You accept the request, and in a short while your account is replenished with the invested funds. Replenishment occurs once an hour, so approximate time of waiting does not exceed half an hour. Once the investment has reached your account, you begin to trade. 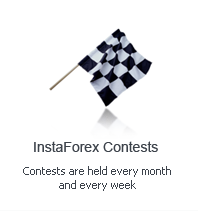 In case of getting profit, your share and that of the investor are displayed on the account monitoring page of InstaForex website. If either you have decided to make a refund to the investor´s account or the investor has decided to take his/her funds back, the investor´s share is debited from the PAMM trader account. At the same time, part of the investor´s profit is credited back to your account.